An organized cleaning closet will make your life so much easier. Learn how to organize your utility closet with this complete guide. 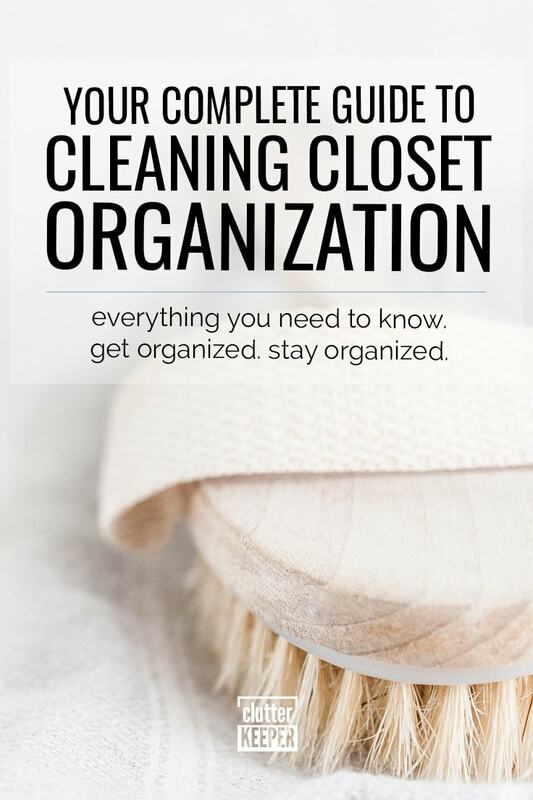 This guide will walk you through every step, and try to answer every question, about how to organize a utility or cleaning closet. A utility closet is incredibly important and sets the tone for the other closets in your home. Plus, when you have an organized utility closet, you can find your cleaning supplies so much quicker! Nope. It’s all right there. And having an organized utility closet will also set the tone of the other closets in your home. When you open up your closet and it’s super tidy and organized, it just makes you happy and more ready to clean the rest of the house. You don’t have a utility closet? We’ll look at how to create one, where to put it, and how to organize one step-by-step. This guide is everything you need to know about how to organize – and create – your utility closet. What is a Utility Closet or Cleaning Closet? Before we organize it or even make a new one, we have to answer a very important question: what exactly is a utility closet? Another name for a utility closet is a broom closet. Some people also call it a cleaning closet. So it’s a place to store your brooms and mops. And more. A utility closet is a cabinet, closet, or storage space for your cleaning supplies. Utility closets vary in size and shape. We will explore a variety of different ones so you can find one that works for you. What goes in a utility closet? It can hold more than just your broom and mop. But try not to create another junk drawer situation. Don’t overfill it. If you have more things than you have space, move some of it to another closet. Here’s a list of things you should store in your utility closet. Every single cleaning supply should have a home. It might be helpful to sort your cleaning supplies by room or cleaning type so that when you clean it, you know where to find it. Bathroom – Put everything you need to clean your bathroom in one basket. Think toilet cleaner, soap scum remover, etc. Kitchen – Store all your kitchen cleaning supplies in one place. Floors – Keep floor polish, carpet cleaner, and other floor cleaners together. Dusting – Keep your dusters and furniture polish together. Deodorizers – Store your room sprays, plugins, and other “smell good” things together. Paper Towels & Wipes – Keep all your disposable wipes together. Windows, Counters & Walls – Store all-purpose cleaner, window spray, and even magic sponge cleaners together. Appliance Cleaners – Put anything you need to clean your appliances in one spot. Where Does A Utility Closet Go? Logically, you want your utility closet closest to where you clean the most. But there are actually a few places you can put a utility closet. A lot of utility or broom closets are located in or near the kitchen. The kitchen is the most trafficked and busiest room in the home. So it makes sense to keep all the cleaning supplies nearby. If you have a small kitchen without any spare space, you can also put a utility closet in your hallway or turn part of your pantry into a broom closet. Just make sure you are keeping your cleaning supplies in a dedicated space in the pantry or linen closet. There tends to be more storage space in the basement or garage. This gives you lots of options for different types of cleaning closets. The only downside to keeping your utility closet in the garage or basement is how far away from the other rooms it is. Will this make you less likely to keep them where they belong? It’s definitely something to consider. Some people also store their utility closet in the laundry room. This way they can keep all their cleaning supplies – including laundry soap – in one place. If you are renting and live in a small apartment, space is a very rare commodity. Maybe you don’t have room for a dedicated cleaning closet. And that’s ok.
You just have to be creative with the space you have. Utilize the backs of doors to hang your brooms and mops. Create labeled bins for your cleaning supplies. If they are labeled and have a lid, you can store them anywhere that you have the room – under the sink, even in your kitchen cabinet. Don’t buy too many cleaning supplies. Often, you can use the same cleaners in a variety of ways. You can use the same bottle of all-purpose cleaner to clean every room. A very popular choice is to buy a free-standing utility cabinet. This is a vertical cabinet that stands on its own. You can purchase free standing broom closets from most major home improvement stores and furniture suppliers. Before you go shopping for one, make a list of what you need to store and measure them. Make sure you are buying one that will fit all your cleaning supplies. What do you do if your house doesn’t have a broom closet? You make one. You can either buy a freestanding utility closet, or you can make one in your kitchen or pantry. To make one, you just need enough space to hang up your broom, mop, dustpan, and store your cleaning solutions. Find a utility closet storage solution that works best for you from the following list. Whether you already have a utility closet that just needs some organizing or you are creating one from scratch, these 9 ideas will inspire you. Pick your favorite one or even use a few ideas to make an entirely new one that fits your house. A shallow broom closet is perfect if you don’t have a lot of room to add another cabinet. You don’t need a lot of space to store your broom, mop, and cleaning supplies. A shallow broom cupboard will give those things a home, and a door to keep them out of sight. Another idea for a utility closet is to create a subdivided cabinet. You can have one side for your broom and mop, and use the divided sections for your soaps and cleaning solutions. You can create your own subdivided cabinet by adding boards and DIY shelving. A pull-out utility or broom closet fits perfectly in spaces like next to the refrigerator. This is a wonderful idea if you don’t have much space. You can even put one in your garage next to your other cabinets. These are fantastic for hanging things vertically. They are typically very narrow, so buckets and thicker items won’t fit. If you already have a pantry, then use the back of your door to hang up your brooms and dustpans. You don’t necessarily need an entire closet for them. All you need to do is install a gripping mop and broom hanger. They are simple to use and make your pantry or closet look so much cleaner. If you have easy access to your utility room, use this space to store your cleaning supplies. Choose an unused wall and install a peg board to hang up your things. Be careful to create a specific space for each item. You don’t want to just move a mess from one space to another. If you are short on cabinet space, then you can use what you have. Take a shelf and dedicate it to your cleaning supplies. Make sure you use labeled baskets or bins to make it clear where your things go. You will be able to find your cleaners a lot quicker if they are separated from the rest of the items in the closet or pantry. No matter where you store your brooms and mops, it’s a good idea to hang them up. Hanging up your broom will extend its life, preventing the bristles from being bent from the weight. Plus, it’s just a hassle to try and reach for something on the shelf, only to be hit in the head by broomstick as it falls on you. Use shower curtain rings and clips to hang up rubber gloves and cleaning rags. This will keep them separated from your other items and make them easy to find. Plus, when you hang them up, you are freeing up precious shelf space for other things like floor polish and paper towels. If you have a closet with a rod, use a hanging organizer to organize your cleaning supplies. The 36th Avenue used hanging organizers for storing rolls of paper towels in their cleaning closet. 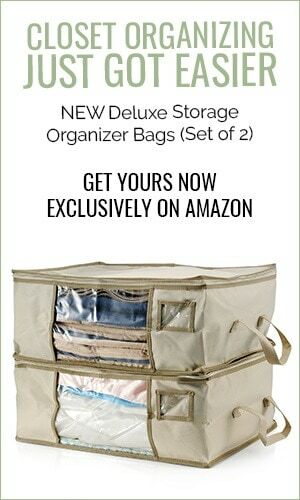 You can store floor cleaner, antibacterial wipes, and even window cleaner all in the hanging organizer. Label each spot so you know where they go and can find them when you need them. Now that you know what a utility or broom closet is and have some ideas of how you want it to look, let’s get it organized! There are 4 super easy steps. You will have an organized utility closet in no time. After you decide where you are going to store all your brooms and cleaning supplies, empty out the space. Emptying out space will give you a visual of all you own. Decide if there are things you can throw away. Only keep the things you use. One of the worst problems with organizing is trying to find space for things we don’t use. Next, clean the utility closet or cupboard. Wipe it down completely. You need to have a clean place to store everything. This will extend the life of your stuff. You might also consider adding a fresh coat of paint or some new shelves. Make it look completely different so it feels better. Curbly has a stunning before and after utility closet transformation and all it took was some paint and new shelves. This is where you put into practice the ideas from earlier. Are you going to hang things on the door? Install the hangers. Label the bins and put your cleaning supplies inside. Put things where they belong. If you discover that there are things that don’t have a home, decide if you really need them. This might take some problem-solving, but don’t just stuff things. Give every thing a home. Part of giving every single product a home means don’t just create a junk bin or add stuff to a “miscellaneous” shelf. Everything should belong to a category of some sort. If you keep creating a junky pile of random stuff, it will all go back to the way it was before. Now that everything is organized and put away, take a step back and smile! This is beautiful! It might seem trivial, but an organized broom closet really can effect the organization of other closets and cabinets in the house. Follow these steps and create a solution that fits your lifestyle and your house. You deserve to live in a well-organized and clean home. 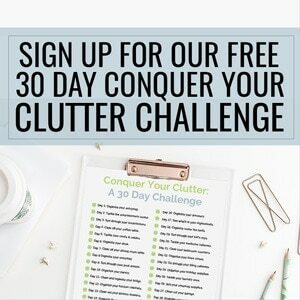 Clutter Keeper has a variety of helpful articles that will give you the information you need. Now that you have an organized broom closet, here are more home organization articles. 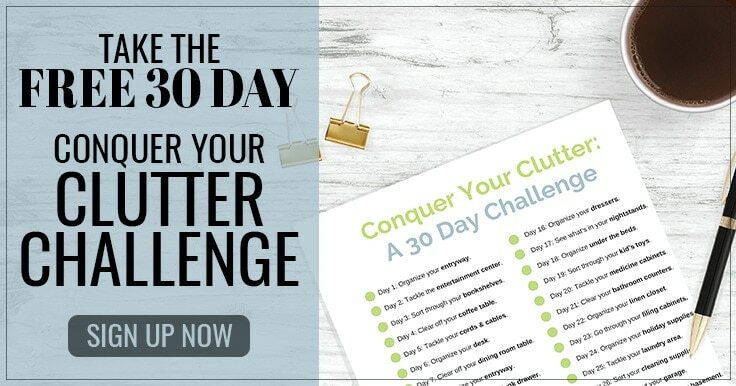 Home Office Organization – This is a complete guide that will walk you through every step to creating an organized home office. Linen Closet Storage – Learn how to create more space in your linen closet so you can store all your things easily. Kitchen Organization Guide – Now that you have an organized broom closet, tackle the kitchen. This guide takes you step-by-step through every section of the kitchen.